But, I do have a few that I trust in their word, and after some consideration, I decided to dive into the Setting Spray pool and see for myself if it would actually do what it was promised: keep your makeup in place for a longer time. This setting spray does what it promises but it has a very strong chemical/alcohol-like scent which I am not a fan. The packaging feels a bit cheap and the pump wasn't the best. NYX - 60ml - €8.35 on Douglas.nl website. 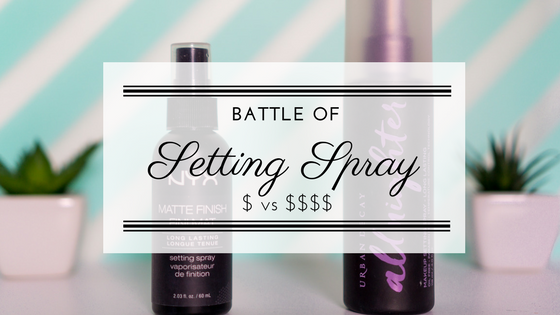 Prior my summer vacation, I had to buy a new bottle but couldn't get the NYX one anymore so I decided to go and spend a "bit" more and get the All Nighter Setting Spray by Urban Decay. I am an Urban Decay fan since day one; all products I have tested from this brand have been 5stars, therefore, I invested in this setting spray. Most reviews online were positive, so, why not?! The packaging is great as it comes with a double cap and the pump feels very sturdy. The spray is quite homogenous and it has a fresh scent almost floral to me. I am still using the UD All Nighter and once it's finished, I will most probably buy a new one. Or, do you have any recommendation? So I can honestly say, I have entered the Setting Spray Gang!! Tell me: do you use any setting spray? If so, which one? Glad you liked the post so much! And thanks for the recommendation; I will have a look.